Fenway-Kenmore - Home of The Fens, The Fenway, Fenway Park, the Citgo Sign, and Kenmore Square,as well as several colleges and fine arts institutions. "Fenway" is the part of the neighborhood east of the Fens; "Kenmore" might be considered to surround Kenmore Square. To the southwest lies the Longwood Medical Area and Brookline; to the southeast, the South End; to the north, the Charles River; to the northeast, the Back Bay, the Prudential, and Copley Square. When the Red Sox are playing at Fenway Park, getting into the area is extremely difficult. While the MBTA does run extra service, expect Green Line cars to be filled to capacity, and be prepared to wait for several trains before you're able to board. Parking garages fill up quickly, and rates are exorbitant: during playoff games, some parking lots have been known to charge up to $100 for parking. The B, C, and D branches of the Green Line stop at Kenmore, and the D branch continues on to Fenway. Despite the name, the closest station to Fenway Park is Kenmore, not Fenway. The E branch stops at Symphony, Northeastern, Museum of Fine Arts, and Longwood Medical Area stations. The Longwood Medical Area station is separate from the Longwood station on the D branch of the Green Line: the two stations are neither related nor interconnected. The Orange Line stops at Ruggles station. This station is several long blocks away from Fenway Park. If you're going to a Red Sox game and want to avoid the crowds on the Green Line, however, it may be worthwhile to take the T to Ruggles and transfer to the 8 or 19 bus routes to get to the ballpark. MBTA bus routes 8, 19, 55, 57, 60, and 65 all stop in the area. From Storrow Drive, take the Kenmore Square/Fenway exit, and follow the signs for your destination. Those going to Fenway Park should take the Kenmore Square exit. There are a number of parking garages in the area, particularly around Fenway Park. The Museum of Fine Arts (MFA), 465 Huntington Ave  [T: Museum of Fine Arts]. M,Tu,Sa,Su 10AM-4:45PM, W,F 10AM-9:45PM. Has extensive collections of fine art from many different genres and historical periods. A proper visit can take an entire day or multiple days for those who like to linger. The Isabella Stewart Gardner Museum, 280 The Fenway, Info: 617-566-1401 Box Office: 617-278-5156,  [T: Museum of Fine Arts]. Tu-Su 11AM-5PM. Housed in a Venetian-style palazzo, the museum displays works by Titian, Michelangelo, Monet, Rembrandt and others. The Boston Symphony Orchestra, 301 Massachusetts Ave (Symphony Hall), 888-266-1492,  [T: Symphony]. The Emerald Necklace Conservatory, . The "Back Bay" Fens is part of the Emerald Necklace (a system of parks designed by Frederick Law Olmsted), which starts here and extends out all the way to Franklin Park. After a slight discontinuity, green space continues down the median of Commonwealth Avenue to the Public Garden and Boston Common. The Muddy River runs through the Fens and out to the Charles River. The park includes shady, sloping lawns and benches for lounging and watching the reeds rustle; rustic stone bridges for admiring the water and its avian inhabitants; a rose garden; a playground; a reserved area for local residents to have "community gardens"; and occasional impromptu performances by Berklee students or The Anonymous Bagpiper of The Fens. Various buildings associated with Northeastern University and Boston University may be found on The Avenue of the Arts (Huntington Av.) and on Commonwealth Av. (respectively) and in the surrounding areas. The Berklee College of Music, Emmanuel College, and Simmons College are on and around The Fenway. In Kenmore Square (which is not so much a square as an incredibly confusing collision of several main avenues, cross streets, and a T stop), you will find a large Barnes and Noble, to which the famous Citgo Sign is attached. There is no associated Citgo gas station; the sign is now a historical landmark. 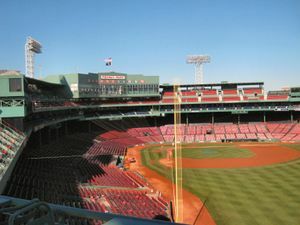 See the Red Sox play at Fenway Park [T: Kenmore or Fenway]. The oldest baseball stadium still in use by the major leagues, this brick and stone structure is named after and located in the Fenway neighborhood of Boston, which itself takes its name from the fens, or marshes along the nearby Muddy River. Visitors arriving via the T will need to walk a short distance from the station to the ballpark, but the crowds on a game day will serve to lead the way. Its worth taking the T to the game because parking is very limited (and expensive) and you get to experience the excitment of a crowded train car full of fans heading to the game. Yawkey Way is now closed off during games, and those in the stadium can walk outside to enjoy the additional refreshment stands and open area, and then return to the game. With sold-out crowds every game, getting tickets is nearly impossible: however, visitors can take a worthwhile Fenway Park tour on non-game days (leaves from the souvenir store on Yawkey Way). Massachusetts Avenue passes by on the northeast side of this area, and has a number of eateries, a hardware store, and a CVS. Pan Thai, 14A Westland Av., 617-236-7907, . Whole Foods Market, Westland Av. Elephant Walk, 900 Beacon St, +1 617-247-1500, . For a slightly different menu combination, The Elephant Walk has a combined French and Cambodian menu. The setting is elegant enough for a special occasion, but intimate enough for a date. $30-40 per person before drinks. Cask 'n Flagon, 62 Brookline Ave., 617-536-4840 . Arguably the most famous sports bar in Boston. Located right outside Fenway Park, this bar is always packed on game days. Game On, 82 Landsdowne St., 617-351-7001 . Opened in 2005, this bar has made a name for itself as a worthy competitor to Cask n' Flagon. Boston Beer Works, 61 Brookline Ave., 617-536-BEER . One of the first microbreweries in the area, with 15 microbrews on tap at any given time. TC's Lounge, 1 Haviland St.
Best Western Terrace Inn, 1650 Commonwealth Av., Tel: 617-566-6260, Fax: 617-731-3543, . Free continental breakfast, free parking and free wireless internet. Hotel Commonwealth, 500 Commonwealth Avenue, Tel: 617-933-5000, . 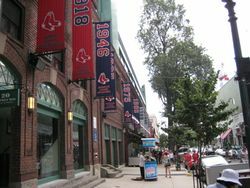 Deluxe hotel within easy walking distance to Fenway Park. Red Sox game packages available. This page was last edited on 6 November 2015, at 10:16.